Lawrence University social media director Kasey Corrado has been named one of four national SimpsonScarborough Scholars by the Council for Advancement and Support of Education (CASE). The program supports the professional development of promising communications and marketing practitioners in the educational advancement profession. CASE administers the scholarships, which are sponsored by SimpsonScarborough, an Alexandria, Va.-based communications and marketing consulting firm that specializes in higher education. Corrado joined the Lawrence communications office in 2014 as the university’s first social media coordinator. She was promoted to social media director in 2016. 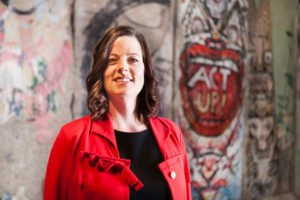 She manages Lawrence’s primary Facebook and Twitter accounts as well as the university’s LinkedIn, Instagram, YouTube, Snapchat, Pinterest and Tumblr channels. 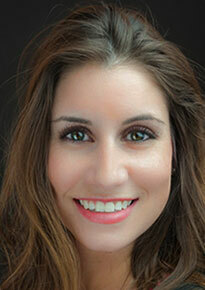 Craig Gagnon, associate vice president of communications at Lawrence, cited Corrado for her initiative and success in developing and implementing a strategic social media program in nominating her for the award. The SimpsonScarborough Scholars program is designed to nurture and sustain the professional development of the scholars, establish a network of scholars over time who become mentors to other promising newcomers, and support the communications and marketing disciplines overall. As a scholar, Corrado will be eligible for several benefits, including attendance at the 2017 Summer Institute for Communications and Marketing, CASE’s flagship training program for newcomers to the communications/marketing field. Joining Corrado as this year’s SimpsonScarborough Scholars are Daniel Baney, communications specialist, Northwest College in Powell, Wyo., Myrna Flynn, communications manager, Smith College in Northampton, Mass., and Paul Kingsmith, communications specialist, Lethbridge College in Lethbridge, Alberta, Canada. Think of it as one-stop social media shopping for all things Lawrence University. In conjunction with the start of the 2015-16 academic year, Lawrence has launched an aggregator page on its website that will house content related to the college collected from virtually all social media platforms. 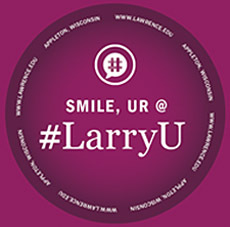 Instead of searching Facebook, Twitter, Instagram, YouTube Tumblr and other channels to see what is happening, being said and posted about Lawrence, the aggregator page will consolidate all content that contains the hashtag #LarryU in a single location as a way to streamline the social media experience. 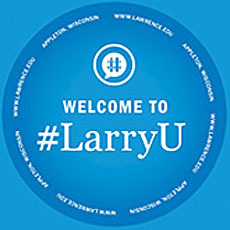 “#LarryU is an exciting new way to experience Lawrence University,” said Kasey Corrado, the college’s social media specialist. “There are so many stories, photos, videos and conversations being shared about Lawrence on social media channels. I have the privilege of seeing a lot of this content, but I cannot share all of it via our university-wide channels. Be sure to keep on top of all the latest Lawrence news and views by regularly visiting go.lawrence.edu/larryu.